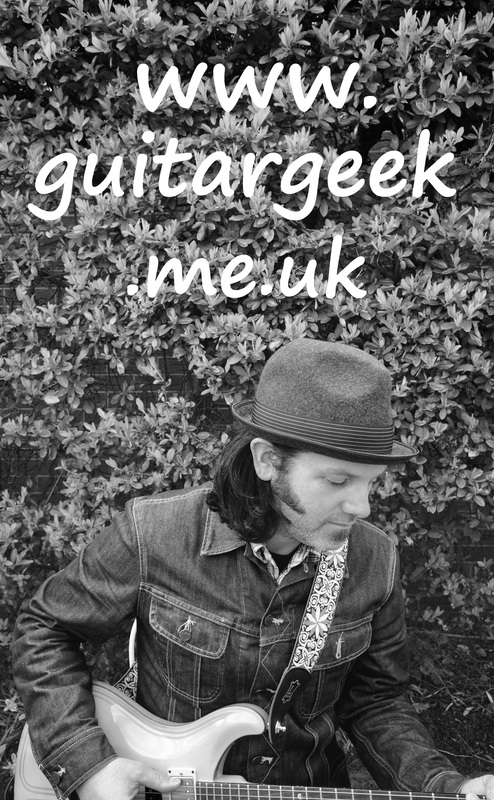 The Story of a Guitar Geek! Simon started playing the guitar at 8 years old, when he began via the traditional route of being given a nylon string acoustic for his birthday. Whilst other friends played for a short time and then gave up, Simon managed to persevere and found that the guitar gave him the voice he had been looking for. After one lesson at school (when he tried to play straight away with a capo) his guitar playing father gave him some pointers and Simon took it from there. After a few months and much nagging, he was rewarded with his first electric guitar, a Satellite Les Paul copy. Then came the Glam Rock phase, aided by the purchase of a white, pointy headstock Aria Pro II that helped forge all his dreams of joining Poison, Cinderella or Bon Jovi! This was the point at which he formed his first band, Mr Benn. Doomed to failure, due to the members vastly varying musical influences, Mr Benn played one gig and then parted due to musical differences!! However, Simon had been given a taste of playing in a band and performing live. Many guitars and haircuts later, Simon finds himself in a great place with his playing. Classic Blues and Rock influences collide with modern inspirations to form his style. Having been complimented on several occasions over the style and width of his vibrato technique, Simon traced that back to his discovery of his fathers ‘Free Story’ LP and therefore the influence of the great Paul Kossoff. Ten years of gigging and recording with the rock band 3 Ring Circus, certainly helped his style to develop and evolve to a new level. The band have played gigs all over the country and also made several festival appearances. Support slots with Seattle power pop legends The Posies and UK Indie stalwarts Mark Morris (The Bluetones) and Chris Helme (The Seahorses) helped raise their profile further. Simon co-wrote and produced 3 albums for 3 Ring Circus with the first being nationally realised via Nova Bomb/Lockjaw Records. The band are back rehearsing with their original lineup and hope to be touring later in 2013. In recent years, Simon and long term writing partner Russell Meek, have undertaken two acoustic tours of the United States. In 2007, they played shows in New York and Boston and then visited again in 2008, playing several shows in Los Angeles and San Francisco. That included an awarding winning performance at the West Coast Songwriters Event in LA, in front of Grammy Award winning producer Michael Silversher. Since 2010, Simon has been part of the acoustic duo, The Nightwires which has again seen him playing all over the UK and producing their first EP and debut album. The duo released their second album in 2015. Now branching out into tuition and session work, Simon’s playing continues to grow. Guitar players never stop learning!